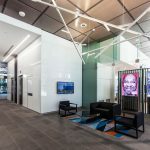 IA Design were engaged to create a new end-of-trip (EOT) facility for an existing office tower in the centre of the Sydney CBD. The tight space restrictions within the existing basement called for an innovative solution to house the state-of-the-art EOT facility. 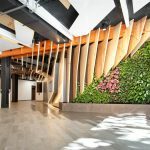 IA Design worked closely with the project managers, structural and service engineers to devise a creative solution to accommodate the EOT facility in the limited available space. The outcome was the construction of a new mezzanine over a two-storey void in the basement to house the bike storage area. This, combined with careful re-design of the existing mechanical services successfully enabled an adequate footprint to house the EOT facility. The project sought to design an energetic EOT facility that would accommodate the functional needs of users while offering a sense of community. The EOT facility included amenities, drying spaces, bike racks and other standard EOT components, as well as a communal space for cyclists to cool down, stretch and interact. Durable materials were used to cater for the fact that the bicycles were wheeled through the facility on a daily basis to reach the racks. The new space successfully achieved its goal of fostering the community side of cycling in the big city environment. A great outcome.